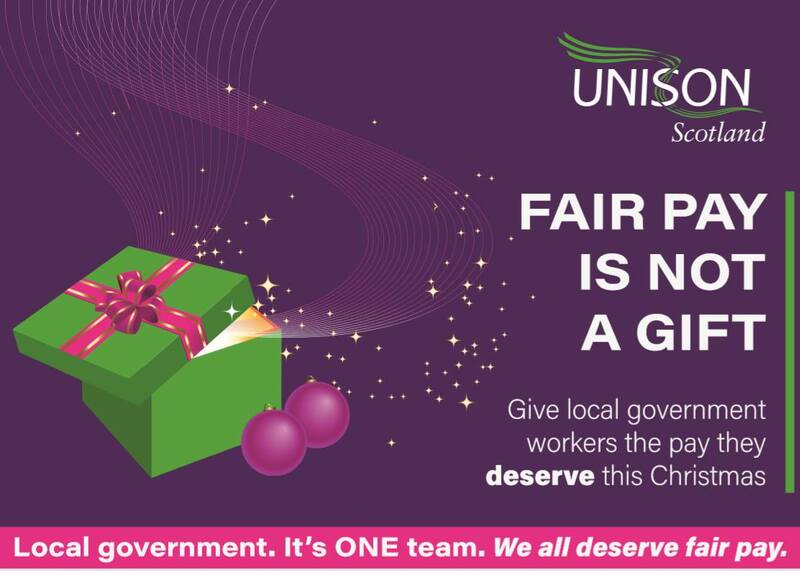 In keeping with the time of year, UNISON Scotland’s Local Government Committee thought it would be nice to make sure Derek Mackay, MSP and Cabinet Secretary received our warmest wishes for the Festive Season. And to also make sure he hears loud and clear that he should be giving us the pay rise we all deserve! Our council stewards and branch officers will be coming round workplaces to get as many of our members as possible to sign the card. All the signed cards will be sent together to Holyrood so that Derek Mackay receives them in time for Christmas. There are a number of council workplaces where we don’t have a steward or workplace contact to co-ordinate the card getting signed. So, if you can help the Branch with this, let us know and a card will quickly be on its way to you. You can do this by contacting the Resource Centre of 01224 620624. Negotiations are continuing and a three way meeting between the joint trade unions, Derek McKay and CoSLA will be held soon. We’ll also have more news soon on the ballot for industrial action and we’ll share this with you as soon as we get it.